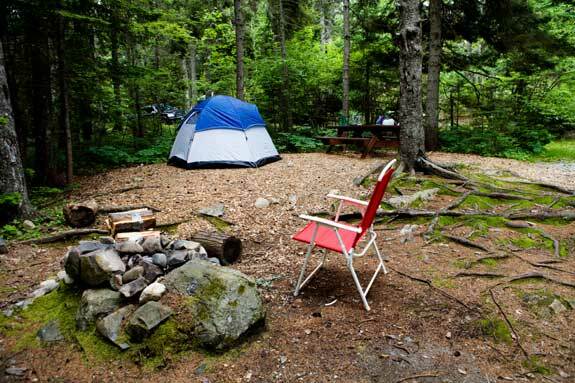 Maine's State Parks offer plenty of opportunities for wilderness camping. Maine features several geographical regions with distinct ecosystems. From the rugged coastal areas to forested mountains, wilderness lovers will find dozens of camping opportunities. Some popular camping areas offer drive-up campsites with toilets and showers. In other areas, primitive backcountry campsites allow you to get away from civilization for a few days. Choose a camping experience suitable for your experience and wilderness abilities, and Maine will not disappoint. Hiring a Registered Maine Guide is an excellent way to learn more about camping and survival in Maine. Outfitters also provide guided camping tours and rent camping equipment. Rangeley Lake State Park, located in western Maine, features over 800 acres of forested land and a clean, clear lake. There are approximately 50 campsites located near the lakeshore, giving you easy access to watersports as well as hiking trails. The campsites have nearby bathrooms, picnic sites, and a playground. The park is open from May to October. The entrance fee is $3 for Maine residents and $4.50 for non-residents. Mt. Blue State Park is the largest state park in Maine, consisting of over 8,000 acres of protected land. The Webb Beach campground has 136 campsites, many of which have RV hookups. Campsites fill up quickly in this popular park, so consider making an advance reservation during the summer months. Entrance fees are $4 for residents and $6 for non-residents. Lily Bay State Park is located on Moosehead Lake in the Maine Highlands region, giving campers access to excellent fishing as well as nearby mountains. There are two campgrounds with 90 campsites total, all of which have nearby access to toilets. The campsites are maintained and staffed during the summer months from May 15 through Columbus Day. Fees are $3 for residents and $4.50 for non-residents. Warren Island State Park, located on Penobscot Bay, provides a unique getaway for campers. The island can only be accessed by personal watercraft, offering a secluded camping experience at one of 12 campsites. Three Adirondack shelters are also available for overnight visitors. A hand-pump near the center of the island is the only potable water source. Visitors must pack out all waste to keep the park clean for other users. Entrance fees are $3 for residents and $4.50 for non-residents. Baxter State Park, in the Maine Highlands region, is a popular site for campers and hikers. The park maintains several campgrounds with dozens of sites. Many visitors also hike into the backcountry to camp at primitive tent sites. Campers should maintain a clean campsite to avoid attracting bears to the site. Although most visitors camp at Baxter State Park in the summer, winter camping opportunities are also available. Campers must register at a ranger station and ensure that they have appropriate warm-weather gear. Entrance fees are $14 for both residents and non-residents. Campsites cost $30 per night in campgrounds and $20 per night in the backcountry. The Maine Island Trail was the first protected water trail in the United States. It stretches 375 miles, from New Hampshire to Machias Bay. Dozens of campsites dot the trail, most of which are accessible by kayak, boat, or other personal watercraft. The Maine Island Trail requires campers to follow “leave no trace” guidelines, packing all waste out when they leave a campsite. Detailed information about trail campsites can be found in the Maine Island Trail Guide, updated annually. The Allagash Wilderness Waterway is a 92-mile stretch of rivers, lakes, ponds, and streams. Camping is permitted at designated places along the waterway, and visitors are encouraged to make advance reservations to ensure a campsite is available. Groups of more than 12 people are not permitted on the waterway or at campsites. Both summer and winter camping opportunities are available, giving you a variety of ways to experience the Allagash Wilderness. The White Mountains National Forest stretches across the New Hampshire-Maine state line, spanning over 1,000 square miles. Although 95% of the forest is in New Hampshire, the Maine portion of the forest offers spectacular camping opportunities. Several developed campgrounds provide vehicle access to campsites. The amenities at these campgrounds vary; some have running water and flush toilets, while others do not. Experienced campers may enjoy backpacking into the national forest. Backcountry camping is allowed at designated sites as well as anywhere greater than 1/4-mile from a trailhead, picnic areas, day use sites, or campgrounds. The Appalachian Trail is one of the most popular hiking trails in the United States, with thousands of people attempting to hike its entire 2,184-mile length every year. The trail terminates in Maine at Mt. Katahdin. Because some hikers begin at Mt. Katahdin and hike south, the Maine portion of the trail is heavily trafficked. Over 250 backpacking shelters dot the Appalachian Trail, providing primitive accommodations for campers. Alternatively, there are designated campsites appropriate for backcountry campers. All campers should be prepared to follow “leave no trace” guidelines to preserve the trail for later users. 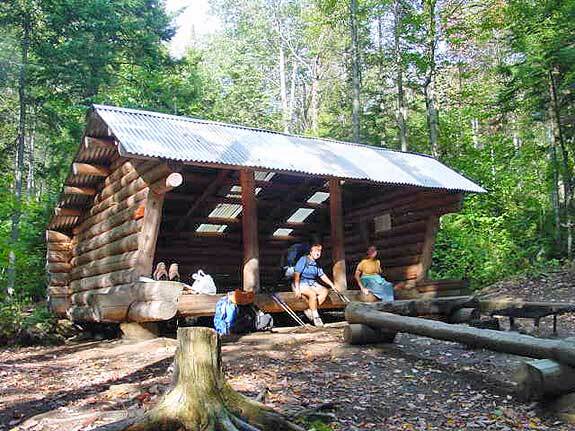 Trail Shelter in the Rangeley Lakes Region section of the Appalachian Trail.